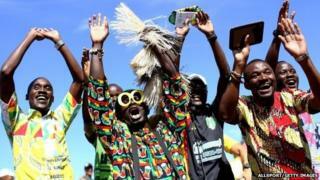 Brazilian federal police say that some 200 Ghanaians have requested asylum after entering the country on tourist visas to watch the World Cup. The Ghanaians say they are Muslims fleeing inter-religious conflicts in their home country. The BBC's Sammy Darko in Ghana's capital, Accra, says the country has no recorded religious conflict. Ghana is seen as one of the most peaceful and prosperous countries in West Africa. The team, known as the Black Stars, lost two matches - to the United States and Portugal - but drew with World Cup finalists Germany. They failed to progress to the knockout stages of the competition. The fact that the Ghanaians have entered the country on tourist visas should not be taken into consideration when considering whether to grant them asylum, a Justice Ministry official said. "Asylum cannot be requested at a Brazilian embassy. The asylum-seeker must be in the country to apply," said Joao Guilherme Granja. "We have hundreds of Syrian refugees in Brazil at the moment in the same situation." Most of the Ghanaian asylum seekers in Caxias do Sul have been given shelter by local Roman Catholic churches.